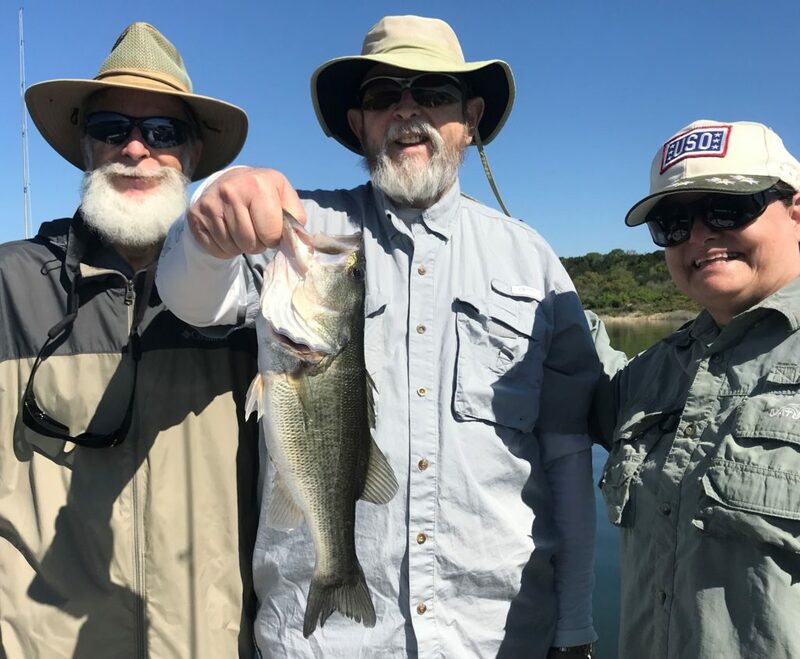 WHO I FISHED WITH: This morning, April 9th, I fished with returning guests Gary and Margaret Moore, and their friend Kirt Bateman, all U.S. Army veterans, all members of Eastside Baptist Church, and all residents of Copperas Cove. PHOTO CAPTION: Kirt landed our largest fish of the trip today. The skies were cloudless and bright and the surface went flat calm after about 8:15am. The fishing just ground to a halt thereafter. I spoke with a number of Lake Belton retiree “regulars”, and each reported the same findings — low catches made prior to the wind’s stoppage. WHAT WE FISHED FOR: This trip was a multi-species fishing trip. HOW WE FISHED: Fishing was very tough today in that as soon as the light ripple we had on the water from the NW died about an hour after sunrise, the fishing died right along with it. The forecast called for that ripple, then had the winds bumping up to 7-8 mph from the NW, but, that simply did not materialize. During that first hour of light, we were tipped off to the location of fish by the activity of multiple flocks of black-headed seagulls, each numbering 15-20 birds. These birds were working shad that were near-shore and near the surface, some of which were forced there by white bass feeding from below. We used slabs, blades, and live shad but the fish were moving so fast and fairly erratically such that it was difficult to take more than one or two fish before having to move once again to keep up. After the wind died, the bite soured. OBSERVATIONS: I witnessed the first evidence of shad actually spawning in shallow water today. This was not the normal “first light” wave of activity, but rather just short forays into the shallows on occasion by small splinter groups of the much larger volume of shad holding just near shore and traveling parallel to it. Wind Speed & Direction: Light NW ripple for ~1 hour after sunrise, then flat calm. Sky Conditions: No cloud cover. This entry was posted in 2019 Fishing Reports. Bookmark the permalink.